Sports is a huge market worldwide. And just as your team needs resources to play in the big leagues, your website needs a bit of investment to stand out from the competition. We’re in no way advising you to hire a dedicated team to design and develop your web page (although if you have the budget for it, why not?). Thankfully, there are plenty of premium WordPress themes that enable you to get your site up and running with minimal time and effort. And we’ve only gathered the crème de la crème. Here are the best sports WordPress themes for 2016. Whether you’re running a soccer club, hockey club, or even a gym, we have something for everyone. Read on. Rounding up our list of the best sports WordPress themes currently available, KickOff was specifically designed with functionality in mind. You can customize the site to the pixel, choosing between tons of layout possibilities with unlimited variations and colors and sidebars. Admins can also manage teams, players, and fixtures at the push of a button. Moreover, KickOff is compatible with WooCommerce, MailChimp, and offers several sliders to choose from. Powerful custom features really make Club Sports stand out from the crowd. You can manage fixtures, results, players, teams, and points, all with ease. The theme offers a polished design, an advanced page builder, and several other features any sports manager would find useful. It’s also compatible with WooCommerce and WPML ready. Sporty is suitable for a variety of sport clubs – soccer, football, basketball, baseball, rugby, volleyball, ice hockey, handball, cricket, and so on. It comes with a Custom Fixtures & Results Plugin to keep fans updated on team activities, multilingual support for a global audience, and lots of easy to use shortcodes. It also bundles the Gallery and Team Showcase plugins, which will allow you to build a gorgeous site with ease. Sporty is compatible with ECWID, so you can also use the website as an online store. 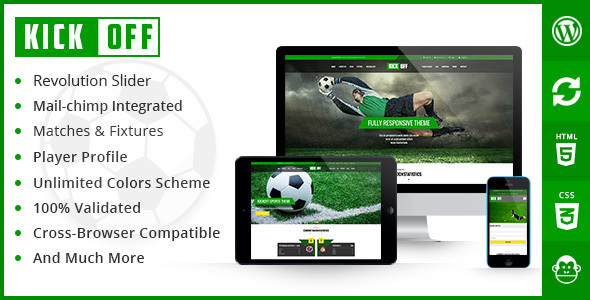 A soccer/football theme built to impress, Champion boasts tons of features any club manager will appreciate. It includes Visual Composer and Slider Revolution plugins, you can choose between two gallery options, and you can easily customize the website to best fit your needs. Champion is also translation ready, SportsPress Compatible, and supports parallax and video backgrounds. Clearly, one of the best sports WordPress themes out there. First things first: Goal Club offers fixture management, player management, result management, league points table management & team management modules. All these custom features pretty much guarantee it a spot on our list of the best sports WordPress themes, and yet there’s more. The theme is also integrated with WooCommerce and MailChimp, WMPL compatible, flexible, and very easy to customize. Its custom admin panel is a thing of beauty and the developers made sure your site it will look stunning on any device or browser. Not too shabby. AllStar’s greatest strengths are its simplicity and flexibility, making it amazingly friendly and customizable. The theme can be used for teams, clubs, and individual athletes – there are multiple demos to choose from when setting it up. Furthermore, it offers a powerful admin panel so you have complete control over how your website looks like. And if you’re after additional resources, the theme also packs a few useful video tutorials. All in all, one of the best sports WordPress themes currently available. 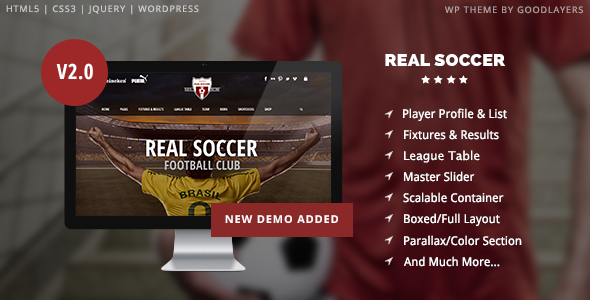 Real Soccer makes our list of the best sports WordPress themes thanks to its custom features: List of Player, League Table, Player profile, Fixtures & Result, and so on. It was built mainly for football/soccer clubs, but can be tweaked to fit your particular needs, being highly customizable. It comes with a user-friendly page builder and includes the Value Master Slider plugin for free. It’s also WooCommerce friendly, so you can sell sporting goods online with ease. 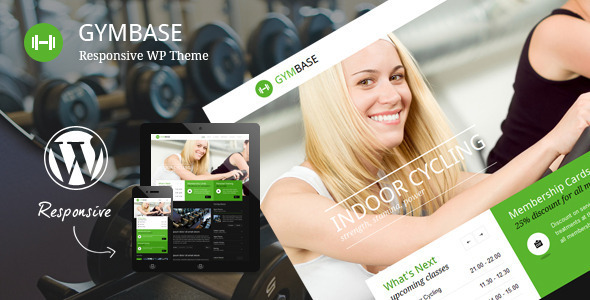 Osage is a multi-purpose WordPress theme that caters well to sports clubs due to its awesome functionality. Highlights include an optional custom-built scoreboard as well as many different social sharing options. The theme also comes with a Featured Slider on each category page, infinite scroll, and a drag & drop homepage. It’s compatible with WooCommerce and bbPress. SportLover was designed with extreme sports in mind. Think paragliding, free climbing, mountain biking, and so on. It comes with a polished interface and tremendous features you can use to showcase your club’s services and promote your business. The theme includes a stylish sliding area, a call to action button, and a blog section to share your stories with the community. Running a gym? This is the perfect sports WordPress theme for you. Posh and polished, GymBase prides itself with its minimal but gorgeous design. The theme includes a blog page with comments, a filterable portfolio with details page, responsive timetable page, classes based on accordion page, and a contact page with a map of location and working contact form. In other words, everything you need to create your site from scratch. Moreover, the theme has a drag & drop page builder to keep things simple, a powerful theme options panel, and it’s fully integrated with WooCommerce. A WordPress theme best suitable for running, athletics, marathon, and fitness clubs, RunPoint offers an eye-catching design and a suite of premium features. You can easily promote upcoming activities via the stunning homepage slider, build an e-mail list to keep track of members, and display your contact details in style. The theme is easy to install and tweak; you can choose between several colors when setting in up and personalize it to best match your brand. There’s no wonder RockClimb earned a spot of our list of the best sports WordPress themes on the market. Its great one-page layout with parallax effect makes a great first impression, while its powerful features are appealing to anyone running a sports website. If you’re a climbing event organizer looking to promote your club, this is the perfect choice for you. RockClimb is flexible, gorgeous, and integrated with all the tools you need to put your best foot forward. 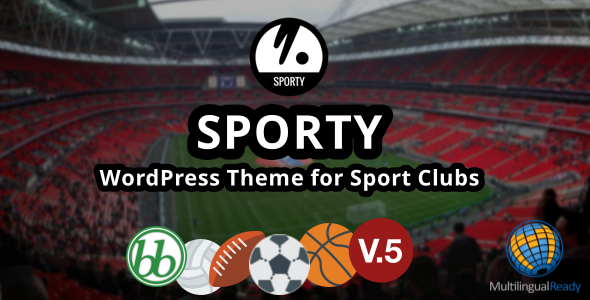 Why Choose One of the Best Sports WordPress Themes on Our List? 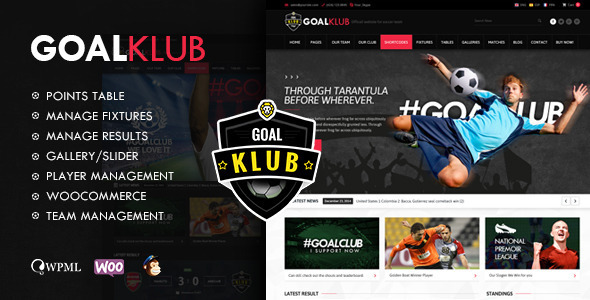 As a club owner, it’s important to connect with fans, and a great website is a first step towards building a solid online community. You can use it to share club updates, official photos and news, showcase your players, or even sell sporting equipment and goods. Pick any of the best sports WordPress themes listed above and you’ll have all the features needed to build a stunning website that makes the team proud. No training necessary. A strong website is key when looking to chronicle major club events. Couple it with a solid social media presence and keeping fans updated and connected will be piece of cake. You’ll be able to build an online community that roots for your team both offline and online. What are you waiting for? Choose one of the best sports WordPress themes above and you’re in business! As always, for more WordPress tips and tricks, keep browsing our website or subscribe to our newsletter.